Fig. 7.1 Three users working in the same space. Two of the other users are collaborating, so they have made their windows overlap (right). The third user is working independently in a separate area (left). The radarView in the third user’s area shows the surrounding vicinity in miniature, allowing offscreen objects and the screen boundaries of other users to be seen. The radarView is updated open enough to see where activity is occurring. Fig. 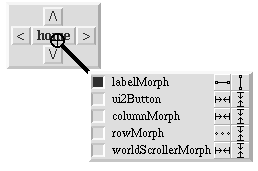 7.2 A composite morph consisting of a row with two buttons. Each button has submorph to indicate its function; one is a piece of text, the other is an icon consisting of two concentric circles. The diagram on the right shows its submorph structure. A morph can be made a submorph of some other morph using the addMorph: operation. This operation updates both the owner slot of the submorph and the submorphs list of the owner to reflect the desired configuration. For example, adding morph B to morph A adds B to A submorph list, removes B from its old owner (if any), and sets B’s owner to A. 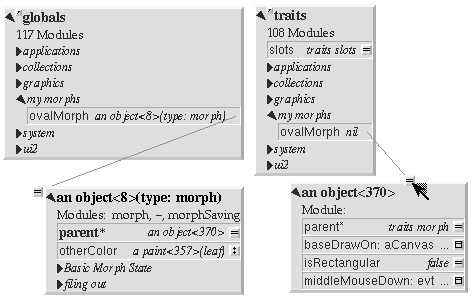 The addMorph: operation also updates the layout of both B’s old and new owners. The global position of a morph is held invariant by addMorph: (although some morphs may perform an automatic layout as a side-effect of addMorph:, immediately changing the position of the newly-added morph). Fig. 7.3 Using the core sampler to probe the submorphs at the point below its cross-hairs. Morphic organizes morphs into a hierarchy much like a class hierarchy. 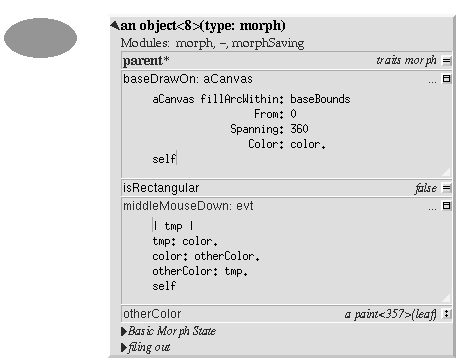 The behavior for all “instances” of a given morph “class” is defined in a shared traits object which is a parent of all the instances. The structure of an instance is defined by the slots of its prototype. The root of the morph hierarchy is traits morph. All morphs inherit from traits morph, either directly or via one or more intermediate traits objects. To see the entire morph hierarchy, invoke the “Show Traits Family” menu command on an outliner on traits morph in the user interface. Be patient; the morph hierarchy is quite large. Note that the class-like organization of the morph hierarchy — with its parallel traits and prototype hierarchies and its use of the copy-down mechanism to propagate slot information down the prototype hierarchy — is only one way that Self programs can be organized. Other parts of the system, such as the world-wide-web browser, are organized differently. Fig. 7.4 A new kind of morph has been created by modifying a copy of the standard morph. The slots baseDrawOn:, isRectangular, middleMouseDown:, and otherColor have been added to the morph to obtain the new behavior. The morph itself appears on the left; an outliner showing its slots appears on the right. Fig. 7.5 A new traits object has been created to hold behavior to be shared by all instances of the morph. Arrow dragging is being used to make the parent slot of the new morph point to the new traits object. Fig. 7.6 Using slot-dragging to move a slot into the new traits object. Using direct manipulation to move and copy slots makes programming feel like manipulating concrete objects. This narrows the gap between composition of graphical objects (building and modifying composite morphs) and programming. Fig. 7.7 Changing the shared traits object changes the behavior of copies of the prototype (instances). In this case, the draw method has been changed to draw unfilled ovals. Next, invoke the “Grab pointer” command by pressing the middle-button menu on the button on the right side of the new ovalMorph slot. Drop the end of the pointer over the new morph prototype and release the mouse. This makes the new slot point to the new morph prototype. Repeat the procedure just described to create an ovalMorph slot in the traits namespace and point it to the traits object for the new morph. Fig. 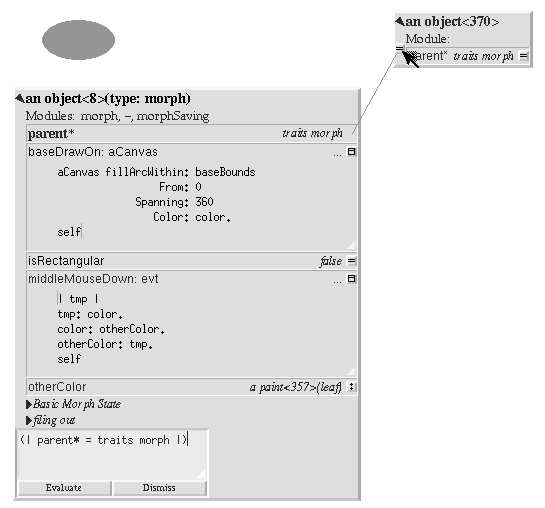 7.8 Installing the new morph prototype and traits object in the globals and traits namespace objects. In each case, a new constant slot is created in the appropriate category, then arrow-dragging is used to make the new slot point to the desired object. Finally, invoke the “Make creator” middle-button menu command on each new ovalMorph slot to designate it as that morph’s creator. This informs the system that the given slot is the given object’s home in the global namespace. (An object may be reachable via several global slots; setting its creator path distinguishes one of these slots as the object’s official “home address.” This information is used to determine the object’s name, as well as which the module in which to record information about the object as a whole, such as the object comment.) In a few seconds (if outliner updating is on), the outliner titles of the ovalMorph prototype and its traits object will be updated to show the new names for these objects. Fig. 7.9 Setting the creator slot of the new traits object. The system uses this information to name objects, among other things. Note that the title of the prototype (on the left) has already been updated to reflect its new name. The system can be told to maintain the copied-down slots of the ovalMorph prototype automatically by setting its copy-down parent (Fig. 7.10). Select the “Show Annotation” command in the middle-button menu on the title of the ovalMorph‘s outliner. Set the copy-down parent field to “morph”, the copy-down selector to copyRemoveAllMorphs, and press the green (top) button to accept this change. (The copy-down selector is sent to the copy-down parent to create a fresh copy from which to copy slots.) The system will ask if the slots “parent” and “prototype” should be omitted from the copy-down operation, since their contents differ from that of that of the copy-down parent. They should be. 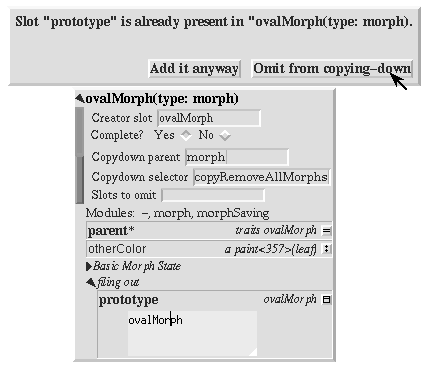 To set the module for the new morphs home slot, invoke “Show annotation” on the ovalMorph slot in the globals object, type “ovalMorph” in the module field, and accept the change (Fig. 7.11). Since this is a new module, the system will ask whether a new module should be created (yes), whether it should be a submodule of an existing module (no), and what subdirectory it should be stored into (“applications”). 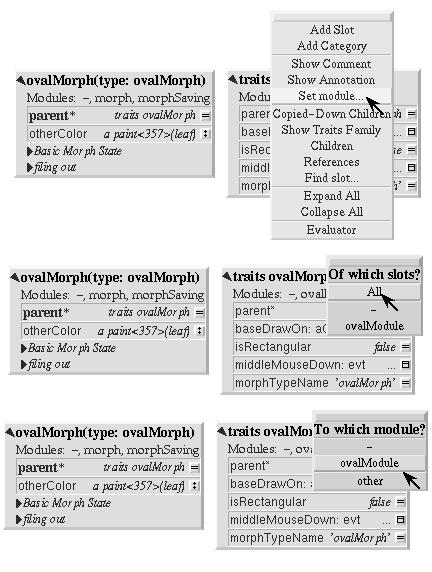 Set the module of the ovalMorph slot in the traits object the same way. Fig. 7.10 Setting the copydown parent for the new prototype. Fig. 7.11 Setting the modules for the namespace slots. The module will be created if it doesn’t already exist; the system asks the user several questions about where the new module should live and whether it is a submodule of some existing module. All the slots in an object (or within one category of that object) can be assigned to a module in a single operation. To assign the slots of the new traits object to the new module, invoke the “Set module...” command on the header of its outliner (Fig. 7.12). The system will ask which slots should be assigned to the module (all) and which module to put them into (ovalModule). After a few seconds, the module summary at the top of the outliner should update to indicate that all slots of the traits object are in ovalModule. 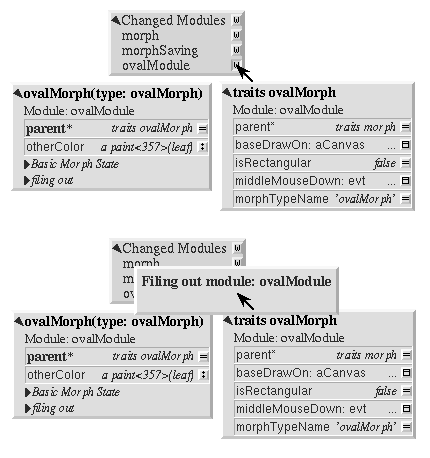 Repeat this procedure to assign all the slots of the ovalMorph prototype to ovalModule. Fig. 7.12 Assigning all the slots of the new traits object to the new module. Fig. 7.13 Saving the code for the new morph in a module file. This procedure does all the housekeeping chores up front, so the module can be filed out at any time. As the programmer works, the system will deduce that any slots added to ovalMorph‘s traits or prototype should be placed in the same module as the other slots in that object (ovalModule). In a future release of the system, the initial housekeeping may be automated. This would make creating a new kind of morph a one-step operation. Morphic represents user actions such as pressing a key or mouse button using ui2Event objects. A ui2Event actually carries two kinds of information: its type, such as leftMouseDown, and the state of the mouse buttons and certain keyboard keys when the event occurred. This allows a program to tell, for example, if the shift key was held down when the left mouse button was pressed. As events occur, they are placed into a buffer. Morphic removes and processes events from this buffer in order. Thus, even if a user occasionally gets ahead of the system, the system will eventually catch up. There are actually two classes of events. keyDown events, the three mouseDown events, and the three doubleClick events are dispatched using the “falling through the submorphs” technique just described. The other events — keyUp, mouseMove, and the three mouseUp events are dispatched only to interested subscribers. The rationale is that some morphs are interested in discrete events, such as mouseDown transitions, while others need to track the mouse or keyboard over an extended period of time. Dispatching high-frequency events such as mouseMove to uninterested morphs would be inefficient. Futhermore, some morphs need to get events even when the cursor is no longer over the morph. For example, a click-to-type editor should continue to get keyDown events until another editor is clicked. In short, Morphic supports both spatial and subscription-based event dispatching because both are useful. Fig. 7.15 Three simultaneously active morphs: an ideal gas simulation, a digital clock, and an outliner on the Self object underlying one of the atoms in the simulation. The clock updates every second, the simulation runs continuously, and the outliner periodically updates its center and velocity slot values as the underlying atom moves. A morph continues to operate while it is being moved (the clock is being moved here) or while an external animation is applied to it. Note that multiple users can be active simultaneously; this example shows the cursors of two users. Each morphic screen window displays the contents of some worldMorph. A worldMorph keeps a list of rectangular “damaged” regions of the screen. Every morph can compute a rectangle that encloses its entire visible representation. When a morph changes its appearance (for example, its color), it sends itself the message changed. This causes its bounding rectangle to be translated into global coordinates and added to the damage list of the worldMorph that contains it. (This worldMorph is found by starting at the morph and following the owner chain; the worldMorph is the last morph in this chain.) On the next display update cycle, the worldMorph redraws the portions of all morphs that intersect rectangles in the damage list (via an off-screen buffer), including the morph that was changed. The worldMorph then clears its damage list to prepare for future damage reports. 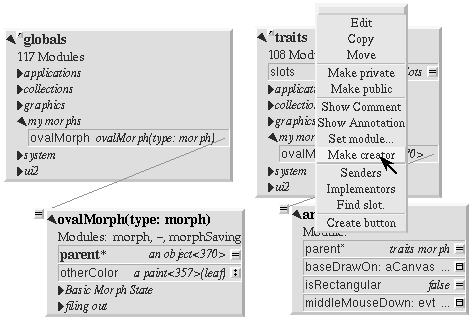 Morphic also maintains morph layout incrementally. When a morph is changed in a way that could influence layout (e.g., when a new submorph is added to it), the message layoutChanged is sent to the morph. This triggers a chain of activity. First, the layout of the changed morph is updated. This may change the amount of space apportioned to some of its sub morphs, causing their layouts to be updated. Then, if the space requirements of the changed morph have changed (e.g., if it needs more space to accommodate the newly added submorph), the layout of its owner is updated, and possibly its owner’s owner, and so on. In some cases, the layout of every submorph in a deeply-nested composite morph may need to be updated. Fortunately, there are many cases where the layout updates can be localized. Morphic detects these cases, thus saving a great deal of unnecessary work. 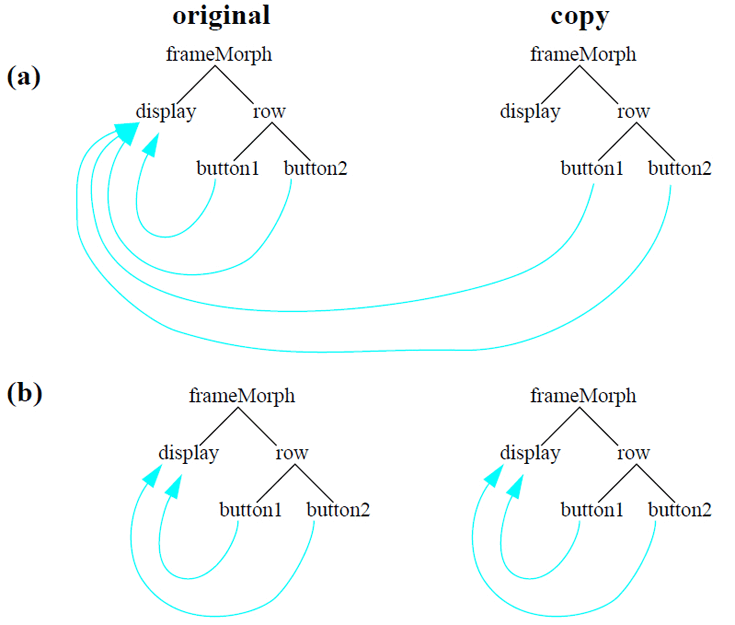 When a composite morph is copied, its entire submorph tree is traversed and copied to produce a duplicate with the same structure. However, simply copying the structure is not quite enough because some of the morphs within a composite morph may refer to other morphs within the composite. For example, the buttons of a radarView refer to the radarDisplay morph. When a radarView morph is copied, the buttons of the copy must be updated to point to the radarDisplay morph in the copy, not that in the original radarView. A simplified diagram of this process is shown in Fig. 7.16. Fig. 7.16 Copying a composite morph. First, the submorph structure of the original morph is copied (a). Then, references among the submorphs of the composite updated to mirror those of the original (b). Colors in morphic are represented by paint objects. A paint can be manipulated as either a red-green-blue triplet or as a hue-saturation-brightness triplet. Red, green, blue, saturation, and brightness are specified as numbers in the range [0.0 .. 1.0], where zero means black or unsaturated and one means full-brightness or saturated. Hue, which corresponds to the angular location of the hue on the color-wheel, is specified as a number in the range [0.0 .. 360.0], where zero corresponds to red. Colors with zero saturation (i.e., black, white, and shades of gray) have no hue; if you increase the saturation of such an achromatic color, its hue is arbitrarily chosen to be zero (red). fontSpec‘s encapsulate some attributes of a font and in the future should perhaps encapsulate the color as well.